The animal kingdom's home in Atlanta is Zoo Atlanta, the longest running cultural attraction in town and an uncontestable favorite of children, locals and visitors. The Zoo opened in April 1939, only a month after the rescue of abandoned animals from a failed circus. Today, the Zoo sustains a world-class status through highly-focused education, conservation and community involvement initiatives.Zoo Atlanta is located in Historic Grant Park and is adjacent to Cyclorama. I'll tell you about those on later posts. The Zoo is very near downtown Atlanta, just off Interstate 20. Arrival at the Zoo is grand enough, but it doesn't lend to the animal and plant life diversity one will find inside. It does hint that the Zoo probably embraces the practice of open-space habitats for its residents, and indeed it does. Be sure to get a map of the Zoo at the ticketing counter, and not to worry…there are ample opportunities to recycle throughout the Zoo. You can recycle your Zoo map at the exit of the Zoo, which shares the same location as the entrance. Visitors enter the Zoo through "Flamingo Plaza." That of course gives away the answer to the mysterious question, "Which came first, the Plaza or the flamingos?" Actually, I don’t know the answer, but I do know that Zoo Atlanta has, over the decades, continually upgraded the animals' habitats (including the flamingo marshland) and created more and more leaning opportunities and fun for visiting humans. The first area one visits, if traveling to the left, is the African Plains. I asked one of the Zoo staff members, "What's the most popular habitat right now?" She told me that of course the panda habitat remains a favorite destination, but also currently exciting visitors is "Zuri," the giraffe calf born on July 13, 2010. Zuri is Swahili for "gorgeous"—and that she is. On a side note, supposedly still on the records is a Georgia state law that forbids the "tying of a giraffe to a street sign or a lamp post." Fortunately, the "tallest baby in Atlanta" doesn’t have to worry about that one. Other residents in the African Plains section include zebras, lions, rhinos, warthogs (also with new babies), and another kid favorite, well-known for their amusing roles in the Hollywood blockbuster Madagascar, are meerkats. Made famous by five-time father Willie B. is the gorilla habitat, part of The Ford African Rain Forest section of the Zoo. Willie B., who arrived at the Zoo in 1961 as an infant and named for former Mayor of Atlanta, William B. Hartsfield, lived indoors for the first thirty years of his life. The outdoor habitat opened in the late 1980s and in 1994, Willie B. sired his first child—Kudzoo. 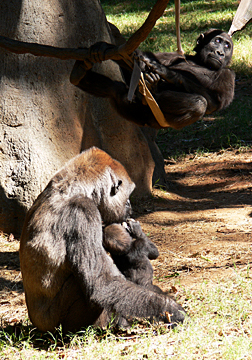 The gorilla habitat also ranks as a fan favorite and boasts numerous vantage points. Residing in an habitat dubbed "The Living Treehouse" are lemurs and exotic birds. The Treehouse offers a unique vista of the living area, allowing visitors to see animals in their true natural habitat—in trees. You can also see monkeys in The Ford African Rain Forest section. Children quickly transform into "giggle monsters" when they get to the orangutan habitat. Seemingly always on the move, the Zoo's orangutans climb, roll, jump and otherwise entertain in ways no other animal on the planet can. They certainly kept my attention…for quite a while actually. 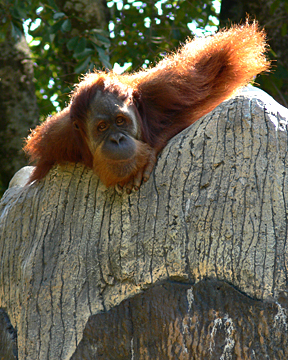 Joining the orangutans in the Asian Forest section of the Zoo are otters, bears, tigers, leopards, red pandas, and the must-see Komodo dragon. 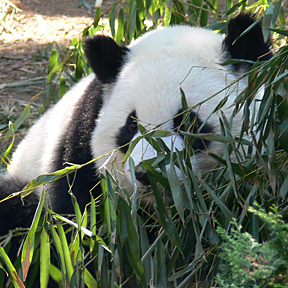 The stars of the Asian Forest section, however, most certainly are the Giant Pandas. Zoo Atlanta is home to three of the approximately 1,600 Giant Pandas alive in the world today and is one of only four zoos in the United States that house the Giant Panda. 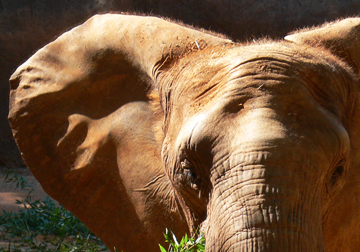 The other zoos are San Diego Zoo, Memphis Zoo, and the Smithsonian National Zoological Park in Washington, D.C. Visitors will more than likely see a Giant Panda eating, an activity that consumes most of its waking day, although they do frolic for the benefit of visitors from time to time. Ninety-nine percent of a Giant Panda's diet consists of bamboo and locals have the opportunity to donate bamboo to the Zoo to keep these black and white wonders fed. Probably the most active area of the entire Zoo is the KIDZone. The Children’s Zoo at Zoo Atlanta is a kids' paradise. 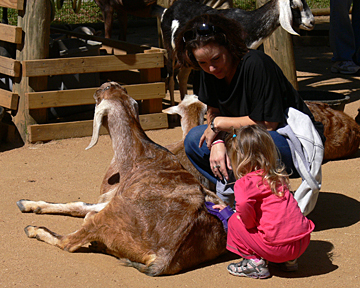 Activities in this substantial portion of the Zoo include a petting zoo; an "Outback Station" featuring kangaroos and crocodiles; and rides including the Nabisco Endangered Species Carousel and a Rock Climber Wall. You can even rent the Zoo's "Birthday Pavilion" for your little one's special occasion to make for a lifetime memory. 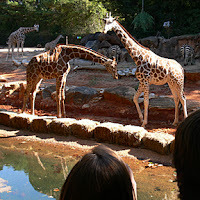 Although Zoo Atlanta seems modest in size, compared to some other zoos I've visited, I'm glad I walked through it twice on this particular day or I’d have missed quite a few habitats and exhibits. For a regular visit, on any of the 363 days of the year that the Zoo is open, plan two or three hours to explore. Be sure to stop by the Panda Gift Shop, the Wildlife Theater and the World of Reptiles. Will I revisit Zoo Atlanta? The baby animals are so much fun to see, I'm certain I'll succumb to the temptation to pay them a visit. Fortunately, announcements of such births usually make the local news or one can always sign-up to receive Zoo news. MARTA: Bus route #97 (from Five Points Station), also known as the "A to Z Route"—it runs to and from the Aquarium and the Zoo.